Because it’s built using web standards, Canvas runs on Windows, Mac, Linux, iOS, Android, or any other device with a modern web browser. Canvas supports the current and first previous major releases of the many current web browsers. Please see the full list available on the Canvas Community for more information. Some supported browsers may still produce a banner stating Your browser does not meet the minimum requirements for Canvas. If you have upgraded your browser but you are still seeing the warning banner, try logging out of Canvas and deleting your browser cookies. Some browser plugins or extensions may conflict with Canvas and affect functionality. If you experience behavior that does not allow you to view or participate in Canvas courses, please ensure you have disabled any extensions or plugins that interact directly with your web browser. For troubleshooting, consider logging in to Canvas using an incognito or private browser window, which will provide a browser session without any prior browsing or search history, associated browser cookies, or other factors that may interfere with the browser. If you are able to view and participate in Canvas using an incognito or private browser window, the behavior you are experiencing is likely related to the browser and not Canvas. We recommend following any browser security policies established by your institution, especially if you are using Canvas on a computer provided by your institution. When displaying content, Canvas defaults to the preference set by a specific browser. Some browsers may occasionally make modifications to privacy settings to protect users from possible insecure content. Insecure content is identified with the prefix http:// in the URL and can create mixed content in your Canvas Page. Secured content is identified with the https:// prefix in the URL. For the best user experience, content should be secure to avoid browser conflicts. If you are a Canvas admin, insecure content may be caused by hosting an insecure JS/CSS file outside of Canvas. if custom uploads are supported for your account, you can host your file in the Canvas Theme Editor, which will resolve any browser conflicts. If you are a Canvas instructor who embeds Canvas lessons inside your course, you can prevent browser issues with mixed content using secured Canvas Guides URLs. In browsers such as Safari, insecure content will never be displayed in the browser. However, in Chrome and Firefox, you have the option to view insecure content. Please be aware of possible restrictions and view insecure content with caution. The following are known issues in Chrome and Firefox that may block or create mixed content within Canvas. Google Chrome verifies that the website content you view is transmitted securely. If you visit a page in your Canvas course that is linked to insecure content, Chrome will display a shield icon  in the browser address bar.You can choose to override the security restriction and display the content anyway by clicking the shield icon and then clicking the Load unsafe script button . Allow access to Canvas via the Adobe Flash Player Settings . This prompt appears in the center of the video and audio pop-up windows, or the center of the browser if you are accessing Conversations. Allow access to Canvas via Chrome’s media permission settings . This prompt appears just below the address bar. Click the Allow button. Firefox verifies that the website content you view is transmitted securely. 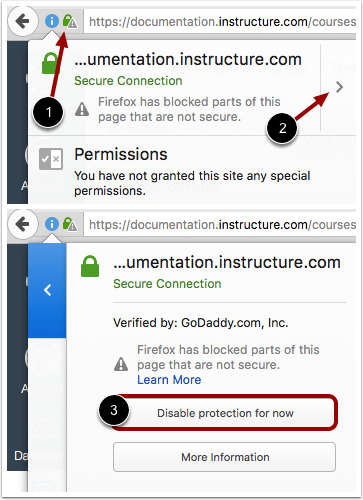 If you visit a page in your Canvas course that is linked to insecure content, Firefox will display a lock with a warning icon in the browser address bar . You can choose to override the security restriction and display the content anyway by clicking the lock with a warning icon, clicking the arrow to expand your options , and selecting the Disable protection for now button . The Canvas interface was optimized for desktop displays, so using small form factors such as phones may not be a pleasant experience in using Canvas. Canvas is not officially supported on mobile browsers. We recommend using Canvas mobile applications for an improved user experience. Note: Android default browser varies per mobile device.